I get lots of requests for Beef Wellington, especially around the holidays. 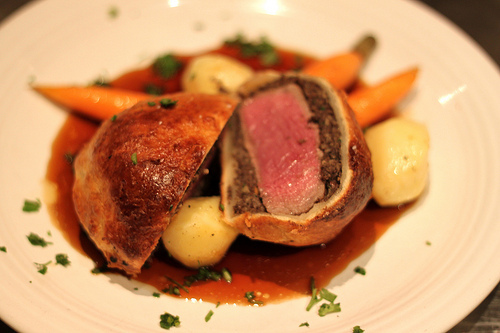 In case you don't know, Beef Wellington is a whole tenderloin of beef, covered in foie gras pate, coated with a rich mushroom paste, wrapped in buttery puff pastry and baked to a golden brown. Sound good doesn't it? That's the problem. The idea of Beef Wellington is amazing, and the aforementioned list of ingredients is spectacular together, but I've always considered the actual dish more of a risky showpiece than anything else. I can sear a filet mignon steak, top it with mushrooms and foie gras, serve it on or near some perfectly baked puff pastry, et viola! That way I can control each component of the dish. When you take the same ingredients and try to perfectly cook them wrapped in puff pastry, you're adding significantly to the degree of difficulty. Having said that, I'll admit it really does make an impressive special occasion dinner centerpiece. So, maybe I'll throw logic to the wind and try and film one soon. It won't be before New Years Eve, so to hold you over, here is the irrepressible Gordon Ramsey doing his Christmas version. Enjoy! I've made the individually encased wellingtons in the past. They're a hit, and really have the 'wow' factor. They are a bit richer than the whole Chateaubriand encased then served as slices, as there is significantly more puff pastry per serving. But hey, if you're doing wellington, you're not really thinking 'light'. I did wonder about his cooking instruction. Did he say 200 degrees? I thought that puff pastry needed higher heat to "puff" and brown. Looking forward to the Chef John version. Blocked in my country by Channel 4 due to copyright issues? I'm in the UK! Technology eh? He probably means 200 Celsius, which is about 400 Fahrenheit. I've never made beef wellington, nor have I eaten. I've heard that it's delicious though. So, I'm impressed that you've done the individual wellingtons. Was it quite a lot of work? He did say 200 degrees, but that's probably Celsius. 200C = about 400F. Anybody know where to buy white truffles and foie gras for cheap online? Ramsay said 200 degrees... Celcius. This is equivalent to 400 degrees Faraneith. @Anon. I think that's 200 Celsius. Anyways, looking forward to your own video Chef John! Thanks all I should have considered the temperature conversion. And, no I don't think it was too difficult. Just several steps. Biggest mistake I made the first time, was overcooking the filets, rather than just searing them. I'd forgotten they'd cook more when browning the pastry. If you've ever used puff pastry to encase brie you can do this. Can't see the video from The Netherlands too. Has anybody made this? How did it turn out? I've always wanted to make it because everything tastes better in pastry! Problem is I'm too much of a wimp to take the risk on a good cut of meat. I suspect that Gordon makes it look a lot easier than it really is. I first had wellington when I was a kid and fell in love with it. To me it was a whole 'meal' in of itself. I make it for rare special occasions now but I make the individual ones not the whole big one that costs $$$$ in a whole big tenderloin. I'm no expert or chef but for some reason this dish is a challenge. Over the years I have found ways to make the duxell vary in savory flavor with what I add to it. I have used the mustard and not used the mustard on the meat. I have used ham or proscuitto or not; and while I love the expensive beef tenderloin that melts in your mouth I have tried it with cheaper pork too with equal success. I have used puff pastry, filo and also 'cheapened out' and used Croissant roll dough which I found works just fine if you prep it. To me this is one of those dishes that is a "fun" think to improvise on and make your own to fit the wallet and time. I look forward to your take on this fun delicious dish and I hope yo have a great new year! is there a good substitute for mushroom? i'm asking, because hubby doesn't like mushrooms - i like mushrooms a lot! I tried to watch the video and it says it's unavailable.You didn't have permission to share it, did you Chef John? Lol I've seen chef Ramsey do this many times on TV so I'm good. Hi,Am I able to use liver pate and mushrooms?